US-based GN Thermoforming Equipment has introduced the new GN800, a high speed form/cut/stack thermoformer which is the first GN model that offers movable top and bottom platens. 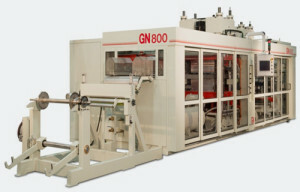 The GN800 was developed in partnership with Agripak Srl from Italy, which manufactured and sold form/cut/stack thermoforming machines until 2003. The first unit has been sold to a European processor for production of polyethylene terephthalate (PET) sealed containers. The company sees there is a growing use of form/cut/stack technology by packaging manufacturers. It is targeting the food, medical and industrial packaging applications with the new GN800. GN bought the rights to Agripak’s original machine design and has added new features and technologies to make it a “GN machine”, according to Mr Romkey. The GN800 has a forming area of 800x570mm, is capable of forming 150mm above and below the sheet line, and the cutting force of the forming and cutting stations is 75 tons. It also has additional space between the forming and cutting stations, providing extra cooling time when running heavier gauge materials or polypropylene (PP). Able to handle a maximum sheet width of 880mm, the machine can run sheet thicknesses ranging from 0.25mm to 1.5mm. The unit comes fully equipped and handles all thermoformable grades of PET, oriented polystyrene (OPS), high impact PS (HIPS), polylactic acid (PLA), PP, and polyvinyl chloride (PVC). The GN800 features a standard oven which is four times the index length of the forming area. High-efficiency Solar heaters are being used in addition to independent top and bottom servo-plug drives for better material distribution. Cut-in-place capability is a standard feature.